The new EX PRO heated motorcycle jacket is the biggest, baddest heated moto jacket we have ever seen! The best part is that it includes a built-in removable heated Gerbing Jacket liner that you can wear with our without the protective outer shell. The EX Pro Jacket is a durable, windproof, waterproof, 3 season riding jacket. 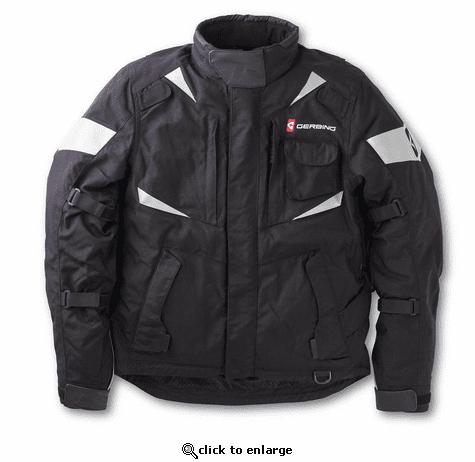 Coupled together with the removable 12V heated liner (included), this jacket becomes a true 4 season riding masterpiece. Whether you are a daily commuter, or a world traveler, this is the ultimate riding kit. Loaded with premium components like YKK zippers, Knox CE rated armor, 3M reflective and DWR coating, it is an exceptional value. The 12V heated liner has all the features and benefits of our standard jacket liner, plus additional light insulation and a zipper rail that is used to connect the liner to the outer jacket. 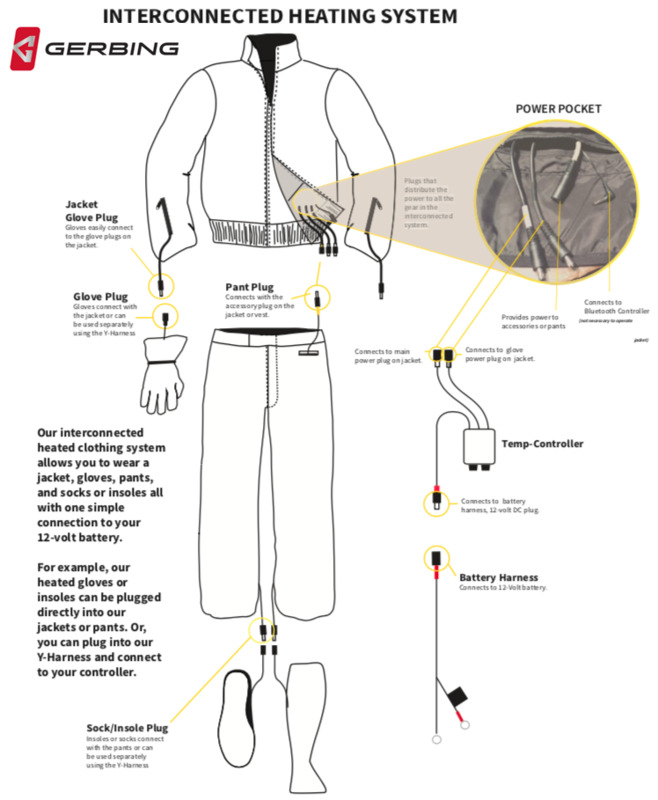 As with our standard jacket liner, there are connections in an internal stow pocket that are used to connect 12V heated gloves, pants, and sock/insole products. Gerbing garments plug right into the electrical system on your motorcycle, snowmobile, ATV, boat or even airplane for an unlimited source of power and keeps you warm at any temperature, any speed. A combination of our patented Microwire heating technologies in conjunction with your electrical system enable Gerbing to provide heat wherever and whenever you need it most. Removable insulated liner with seven Microwire heating zones: collar, chest (2), sleeves (2) and back (2). Gerbing Core Heat 12 Power System: The Core Heat 12 thermovelocity system is powered by a simple connection to your vehicle's DC power system. Core Heat 12 technology connects to your motorcycle, snowmobile, ATV, boat or even airplane to keep you warm at the temperature of speed. Gerbing 12V Products Include: Includes battery harness and fuses, essentially everything you need to power your Gerbing Core Heat 12 product. We recommend a Gerbing Temperature Controller for maximum comfort. Great fit, excellent price, outstanding function. Very much like the reflective material. ConsNone noted, at this time. This jacket has made cold weather riding an absolute joy. I plug in and within minutes I am toasty warm and enjoying my ride.The jacket is very well made and fits perfectly. I don't have a single gripe about it. Plus you can remove the liner and use the jacket without it and/or you can use the heated liner with other jackets. To top it off it is a warm jacket without even plugging in which speaks to its quality and its all weather prof. I absolutely love this jacket and couldn't live without it when its cold and damp riding weather. ProsPerfect all weather motorcycle riding jacket. Apparently high quality & The Warming Store was great. Suggest that purchasers seriously consider ordering larger size than fitting chart ! More cold weather riding ahead for me. I rode to Daytona Bikeweek (March 2016) from Ohio in 34 to 42 degree weather without any heated gear. No more. I learned about Gerbing's Gyde wear at a Green Beret Foundation fund raiser. I have ridden 1,100 miles since Christmas (last 2 months) with the Ex Pro Jacket, Ex Pro over pants, and Vanguard gloves. The Bluetooth Thermogauge dual controller worked great. I am please with all of the products and have since bought the heated socks liners, lightweight heated gloves (sale price I couldn't pass up) and a Gerbing base layer shirt. ProsJacket liner has a 'thumb' slot to keep the jacket from riding up your arms; Rode 175 miles in the cold rain and no leaks; No hot spots in any of the items (Couldn't even tell that the Vanguard gloves were heated. My hands were very comfortable.) Pockets on jacket and pants are well placed and functionable No bulky under layers are needed. ConsNo Cons Observations: 1. I normally wear an "XL" but needed a "2XL" in both the jacket and over pants. Order one size bigger than you normally wear. 2. Take the time to test ride all of the gear before taking the long trip. Getting to properly manage the Bluetooth Thermogauge control to your desired temperature takes practice and multiple stops. Was surprised how heavy the jacket is. Fits comfortably. ProsWorks great with bike. Like the fact you can also buy a rechargeable 12volt system. Great to be able to remove the liner when needed. 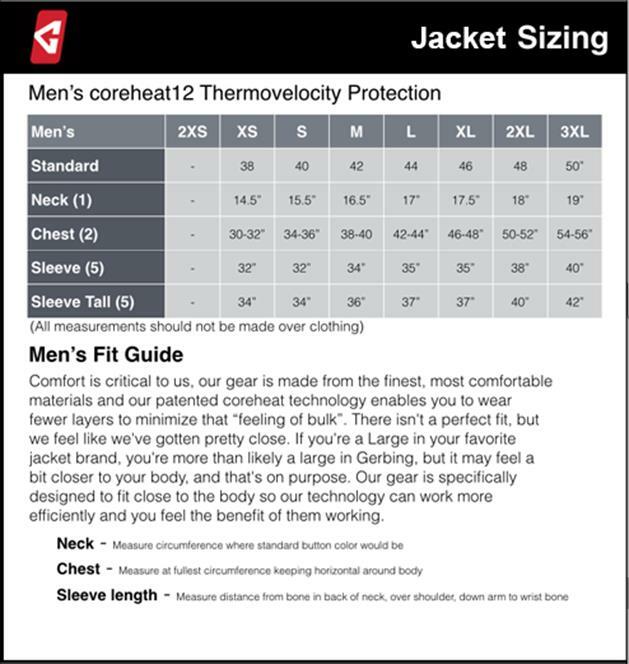 ConsDon't give all information about the jacket, Example the weight of jacket. If you don't have Bluetooth capabilities, they don't tell you that you should get a single or dual temp controller. The price was a little high but when on sale, it was ok. Bluetooth temp adapter does no good unless you have Bluetooth capabilities. It might be worth it then.